The worst house sitter I ever had was the one I had to pay. For years, my long trips seemed to coincide with a friend or friend-of-friend’s need to escape difficult roommates, find somewhere to live during a breakup, or stay for the summer when home from working abroad. All of these were mutually beneficial situations—my house was lived in and cared for during my absence, and a friend had somewhere to stay rent free. Win win. Then came a month-long trip with no potential house sitters in sight. It was probably positive that I didn’t have any friends in crisis, but it left me with a dilemma. Fortunately (or so I thought), a friend told me about an experienced house sitter named Melanie. * Paying for a house sitter was a new concept for me, but a reasonably priced acquaintance of a friend seemed like the ideal solution. My first inkling of trouble was the voice mail message I received in Germany. 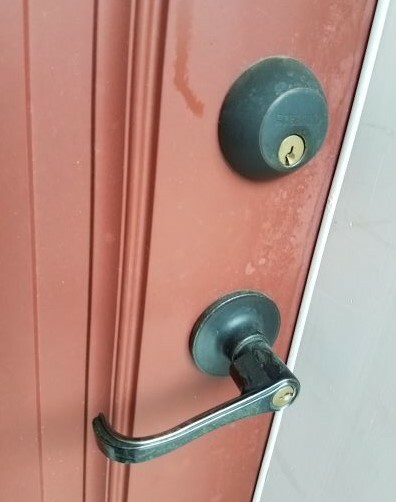 Now admittedly, there was a quirk with my door, but I’d explained that to her in detail—both verbally (with lots of emphasis on not closing the door without a key in hand or confirming the door was unlocked) and in my written instructions. And I wasn’t sure what she expected I could do to help when I was 5,000 miles away. Hop on a plane? By the time I got the message, she’d been standing outside of my house, in her pajamas, for an hour. I suggested she call one of my friends, whose numbers I’d given her, who had keys to my house. But no, the phone numbers were in the locked house. And in those days before cellphones roamed internationally, I’d left my U.S. cellphone (where all my contacts were) at home. Fortunately, I had one of the friends’ numbers memorized and gave that to her. I pointed her in the direction of my nicest neighbors if she was getting cold or her cellphone battery ran out. I suggested she could pay a locksmith to let her back in. I felt sort of bad hanging up at that point, but had nothing else to offer her. “Good luck. Let me know how it turns out.” And I went out to dinner. I later learned that she’d called her mother to rescue her while trying to get hold of my friend to get back in the house . . . which she eventually did. My next inkling of trouble was after I got home. She’d already moved out by then, we’d chatted by phone and laughed (I thought) about the lock-out situation. I’d sent her a check. But I should have waited until I used the door myself. The next day, I put my key in the lock. Or tried to. The key wouldn’t go in, so the door’s deadbolt wouldn’t unlock and I had to let myself in through the back door. I’d been to the grocery store to restock after the trip and started putting things away before I called her about the door situation. Except nothing was familiar in my cupboards. Boxes that had been in cupboards on the east side of the kitchen were on the west side of the kitchen. Cans that had been in cupboards on the west side of the kitchen were now in the pantry. What cyclone had hit my kitchen? I called Melanie, and asked if she’d experienced any problems with the deadbolt. And she wasn’t going to tell me? Did she think I wouldn’t notice? And who breaks something on a stranger’s house and doesn’t tell them? I resisted the urge to ask her if she had a background in breaking and entering that would have made the picking-a-lock-with-a-stick plan seem like a practical idea. EVERY SINGLE item in two cupboards had been moved. Carried away seemed like an understatement. The odd thing was, she didn’t even seem embarrassed or apologetic for breaking something, hiding it, and not offering to have it fixed . . . or for rummaging through cupboards she had no business in. I think my house might have been safer left on its own than under the influence of Cyclone Melanie. I suppose it could have been worse. The plants were watered and no family heirlooms disappeared. But it’s made me wary of house sitters. At least, the ones who want to be paid. Now, whenever I plan a trip, I have a battle with myself. I don’t really hope a friend will have a housing crisis, but . . .